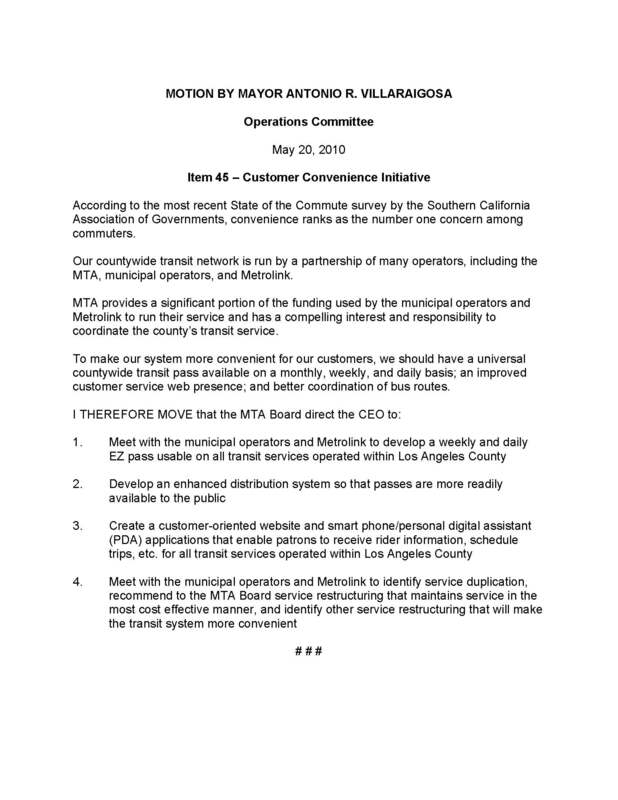 The Board of Directors of Metro meet on Thursday and they will be considering this interesting motion by Los Angeles Mayor Antonio Villaraigosa that asks the agency to develop a daily and weekly EZ Pass and develop a regional trip planner. The motion is in response to a recent string of columns by the Los Angeles Times’ David Lazarus, who has opined that more needs to be done to make it easier for people to take mass transit in the Los Angeles area. The EZ pass allows transit users to travel across buses and trains run by most agencies in Los Angeles County (here’s the list). It currently costs $70 for a monthly pass but is not available as a weekly or daily pass — both of which would benefit occasional transit users who need to use more than one transit system to get where they’re going. Nor is the EZ Pass available for purchase on TAP cards. An amendment was also introduced by Supervisor Mike Antonovich to have the agency look at distance and time-based fares. Metro currently charges fares based on how many individual lines a rider uses — it’s $1.25 per line or $5 for a day pass. Other transit systems allow unlimited travel on different lines for a set period of time — although the base fare is usually higher than Metro’s. In fact, we raised that very subject in our recent fare structure poll. If you haven’t taken it, your vote would be appreciated. It’s a good chance to let the Board of Directors and Metro staffers know where you stand on the fare structure issue, particularly since they’re going to be discussing that issue soon. Villaraigosa’s motion also calls for a website that also works on cell phones to better help transit users get around Los Angeles County, with schedules from all the county’s transit agencies. Surprisingly, there’s nothing really like that already in existence. The closest thing to it is Google Transit, although even that is limited by not having schedules for many of the smaller municipal bus operators in the county. There is also a go511 website in its beta stage that should be able to plan transit trips around the region, but it doesn’t have a mobile version and I couldn’t even get it to provide information this morning on a simple bus trip on the Pasadena city system.